The hot trend on fashion runways is eco-friendly designs. 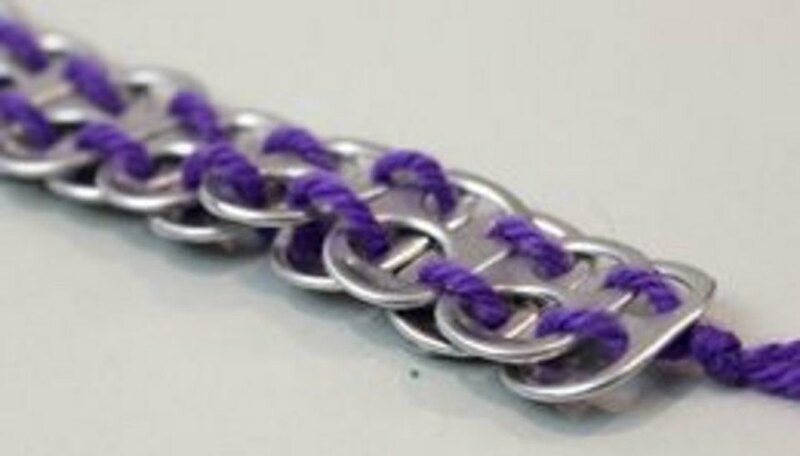 Now you can tap into your inner fashionista by creating this belt made with recycled pop tabs from soda cans. It’s good for the environment, and for your fashion sense. 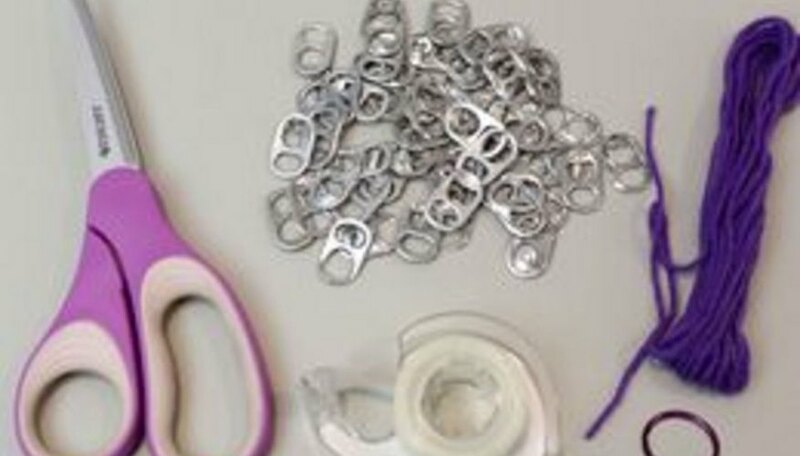 To make a belt, you'll need about 100 pop tabs from soda cans, so have your friends and family help you collect them. Please see the last slide for an itemized list of tools and materials. Cut about 12 feet of yarn or string to make the belt. 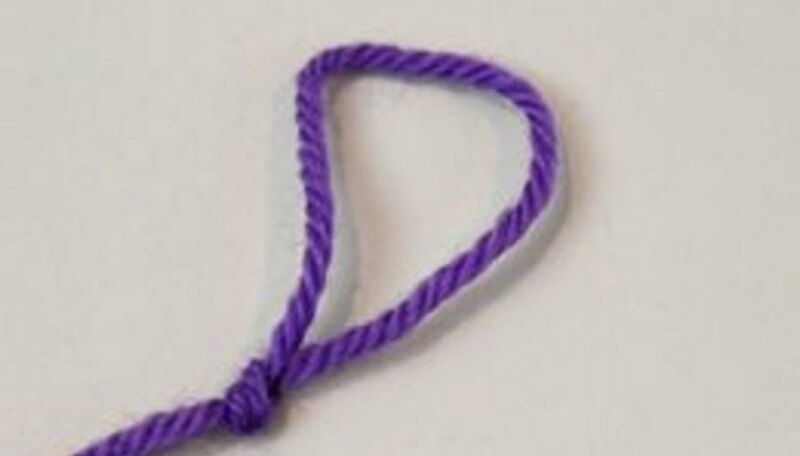 Find the middle of the string, and tie a loop at the middle. This is where you’ll start adding the pop tabs. You will now have two six-foot strands with a knotted loop in the middle. Cover the ends of the strands with tape. This will make threading the string through the pop tabs easier. Position the strings horizontally in front of you so they run parallel. Hold the pop tab so that the front side is toward you. 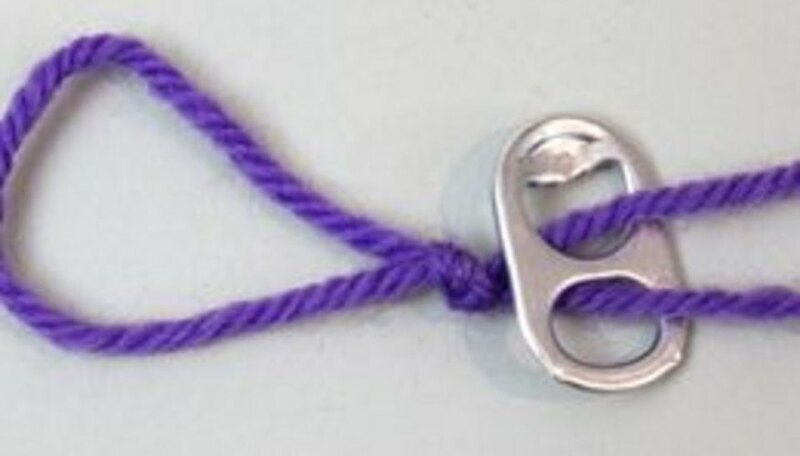 Thread the top string through the top hole of the first pop tab, and the bottom string through the bottom hole. Be sure you thread the string under the left edge of the pop tab, through the hole, and over the right edge. Place the second pop tab on top of the first so that the holes overlap. Starting with the top string, thread it through the space where the holes overlap. Do the same with the bottom string. In other words, the strings go over the left edge of the second tab, through the hole, and under the right edge of the first tab. Place the third pop tab under the second so that the holes overlap. Again, thread the strings through the spaces where the holes overlap. In this case, the string goes underneath the left edge of the third tab, through the hole, and over the right edge of the second tab. Place the fourth tab on top of the third tab, side by side with the second tab. Again, thread the strings through the spaces where the holes overlap. 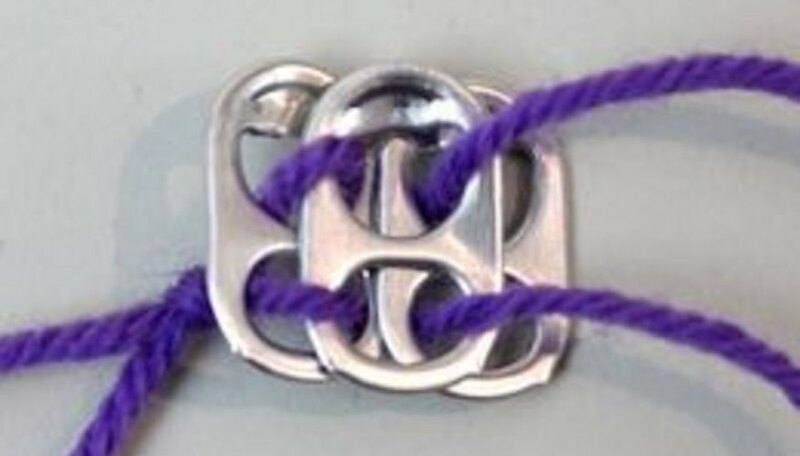 Here, the string goes over the right edge of the second tab and the left edge of the fourth tab, down through the hole, and under the right edge of the third tab. It sounds confusing, but follow the photograph and it will be clear. Once you’ve thread the first four tabs, you’ve mastered the technique. Now continue with the rest of your pop tabs until you reach your desired length. It’s a good idea to make it about a foot longer than your actual waistline. 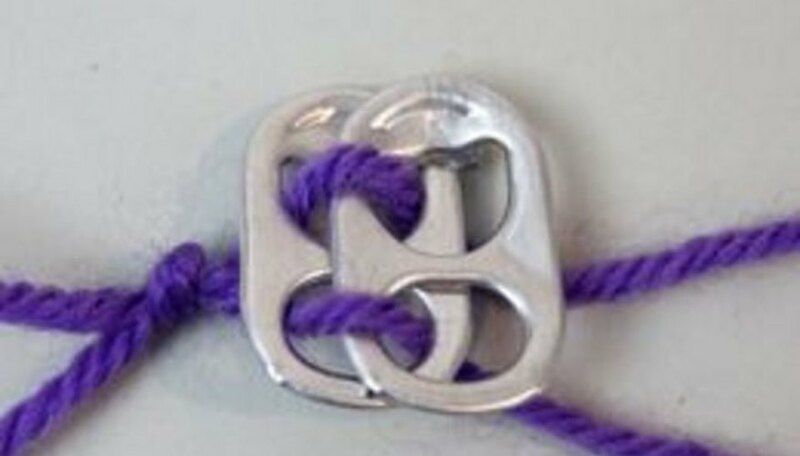 On your last pop tab, tie a double knot with the strings to keep them from unraveling. Add a key ring to the final pop tab. 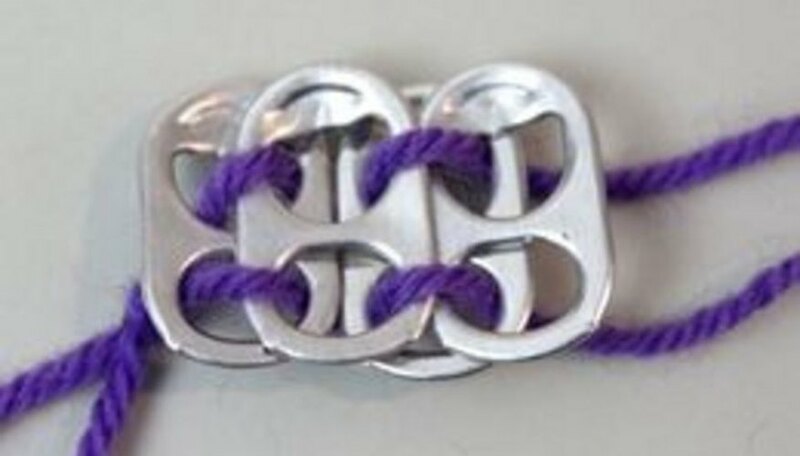 To wear the belt, slip the end tabs through the loop of the key ring. Sand the backs of the pop tabs if they are rough or have sharp edges. Select yarn or string that is stretchy so the belt can stretch.